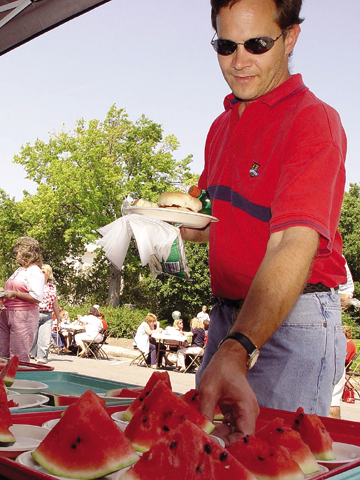 Gary Kimminau, assistant manager of Information Services, takes a slice of watermelon at the all-university picnic, which followed Chancellor Harvey Perlman's Sept. 9 State of the University speech. Photo by Troy Fedderson/University Communications. An ongoing effort to increase recruitment and retention of faculty and staff is taking aim at making UNL more family friendly as Chancellor Harvey Perlman outlined a plan to establish a privately run childcare facility on campus. Student enrollment for the fall semester dipped to 21,675, down 117 students compared to a year ago, but UNL has welcomed a 9 percent increase in first-time freshmen. An invitation to attend UNL has allowed 16 students affected by the ravages of Hurricane Katrina to continue their education this fall. Seventeen years of research have brought scientists to the brink of developing an effective, low-cost treatment for Hemophilia B, a debilitating genetic bleeding disorder. A recently commercialized test developed by UNL food scientists that quickly detects traces of soy flour is helping food processors better protect consumers with food allergies. A UNL agricultural economist's research is offering a glimpse at the potential economic losses caused by Hurricane Katrina's disruption of grain exports. NU President James Milliken announced a new scholarship initiative to benefit students and families affected by Hurricane Katrina. The UNL Libraries has received a donation of more than 5,000 color slides and negatives of the Nebraska Sandhills from UNL alumnus Jim Ducey. This window in Ruth Leverton Hall features the Betty Lamp, a symbol th represents the field of Home Economics. The Department of Theatre Arts at UNL has been re-named The Johnny Carson School of Theatre and Film. On Sept. 18, NET Radio will team with Lincoln community radio station KZUM (89.3 FM) and UNL's Lied Center for Performing Arts, with support from TierOne Bank, to present a two-hour Nebraska benefit concert, "Help the Healing: Statewide Hurricane Relief Benefit." The Association of Students of the University of Nebraska, University Program Council and UNL Greek Affairs, in collaboration with The Rococo Theatre, will present "Rock for Relief," a benefit concert for the victims of Hurricane Katrina. The concert is from 5 p.m. to 10:30 p.m., Sept. 15 at The Rococo Theatre (13th and P streets). The Mary Riepma Ross Media Arts Center will participate in the Film Society of Lincoln Center's Latinbeat 2005 Film Festival, a seven-title syndication brought to Lincoln by Emerging Pictures, the New York-based digital cinema network. The curated selection of films, shown with English subtitles, will run concurrent with the festival's Sept. 7 to Sept. 22 run at the Walter Reade Theater in New York. Filmmaker Kelley Baker will appear at a screening of his latest feature Kicking Bird at the Mary Riepma Ross Media Arts Center on Sept. 19. UNL's Robert Hillestad Textiles Gallery will showcase two new exhibitions of woven and constructed sculptures composed of metal wire, beads, and natural materials. Nancy Koenigsberg: Line and Shadow; and Lewis Knauss: Ledgers will be on display until Sept. 30. Theatrix, the student-producing group of The Johnny Carson School of Theatre and Film, opens up the Fall 2005 season with Michael Cristofer's The Shadow Box. Beginning Sept. 22 in The Studio Theatre at the Temple Buliding, The Shadow Box explores the last days of three terminally ill people set in a cottage hospice. These three stories intertwine as their families and loved ones surround and support them as they all face death and attempt to make sense of it. On Sept. 16, Lincoln's own Baby Needs Shoes will present a free public concert as part of the Lied Center for Performing Arts' Free at 6 series. The concert will begin at 6 p.m. and weather permitting, will be held outside at the Friends of Lied Plaza, directly to the north of the Lied Center. In the event of inclement weather, the concert will be held on the Lied Center's main stage. In this poem by New York poet Martin Walls, a common insect is described and made vivid for us through a number of fresh and engaging comparisons. Thus an ordinary insect becomes something remarkable and memorable.